I believe fitness and nutrition are as much about health and wellness as they are about the prevention of illness, disease and injury. -PFIT Personal Trainer -The Cooper Institute Personal Trainer and Providing Dietary Guidance -500 hours Massage School. 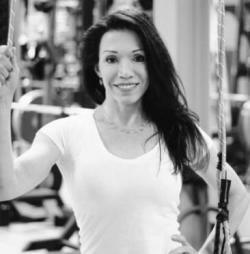 -Specific experience with: -Rehabilitation/PT with clients post spinal fusion, total knee replacement, meniscus repair, mastectomy; clients with degenerative spine issues; Multiple Sclerosis, IT band syndrome, neuropathy, winged scapula, etc... -3 years experience in a Senior Fitness Program. -In 2004 I Established "Get Fit Kids!," a children's fitness program. Received referrals from pediatricians. -Over 10 years teaching gymnastics, dance, and swim to children. -Over 22 years of combined experience distance cycling, gymnastics and dance. -Over 500 hours of massage school to enhance my work with my PT clients.